Can Bryce Love or Khalil Tate still make a late run? For the first five weeks of our Heisman Trophy voting, Saquon Barkley and Bryce Love were in control. Last week, their dominance ended. Baker Mayfield seized the moment and vaulted to the top of our poll. Week 11 of the college football season saw Mayfield lead Oklahoma to victory in a Top 10 match-up against TCU. Would any contenders be able to gain ground on Mayfield after such a strong performance? Let’s take a look at our sixth poll for 2017 and see how our voters see the race through eleven weeks of the college football season. Last week: 18 of 27 passing (66.7% completion rate) for 333 yards with 3 TD and 0 INT and 50 yards rushing. Season: 213 of 299 passing (71.2%) for 3559 yards with 31 TD and 5 INT. 231 yards rushing with 5 rushing TD. Mayfield solidified his lead on the top spot this week by racking up 383 yards of total offense against TCU, which currently ranks 13th nationally in total defense. At the rate he’s producing, it’s tough to see anyone else hoisting college football’s most coveted trophy this year. He seems to be distancing himself with this award, and with good reason. But with the Heisman race, you’re always one bad game and a loss away from falling back to the pack. However, it’s not expected with Mayfield and his case only strengthens each week Oklahoma looks like a potential playoff entrant. Mayfield continues to play well in big games for the Sooners. (Though he’s played well in every game this season.) 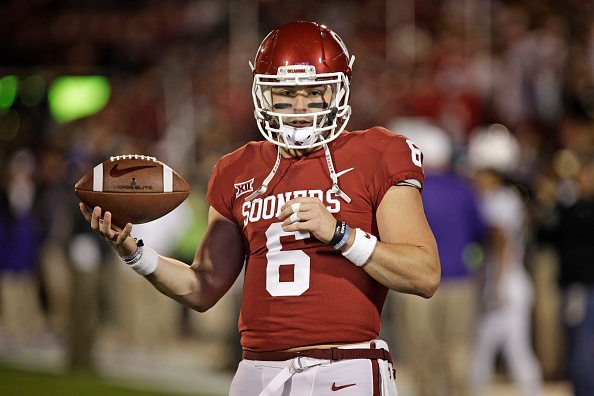 If TCU was Oklahoma’s last big test before the Big 12 title game (and a possible rematch), throwing for 333 yards with three touchdowns and no interceptions is yet another impressive notch on Mayfield’s Heisman résumé. Bryce Love had a great game in Stanford’s upset of Washington, but that doesn’t feel like enough to overtake Mayfield as the front-runner. He’s got the momentum now. Season: 1622 yards rushing on 181 carries (8.9 ypc) with 15 rushing TD. Last week: 206 yards rushing on 16 carries (12.8 ypc) with 2 rushing TD. 5 for 7 passing for 68 yards with 0 TD and 1 INT. Season: 1293 yards rushing on 111 carries (11.6 ypc) with 11 rushing TD. 65 for 105 passing for 998 yds with 8 TD and 6 INT. – Here’s a look at who was in the lead in our Heisman voting from 2011 to 2016. – The above history lesson tells us that Baker Mayfield is in fantastic position to take home the trophy. The last time a player lost their Heisman lead this far into the season was 2012 when we had Collin Klein in the pole position. – Wisconsin’s Jonathan Taylor has not gotten much press for the Heisman, but it is hard to ignore his numbers. Taylor has over 1500 yards rushing. He leads the Big Ten in rushing by over 500 yards. He has a league-best 12 rushing touchdowns. His Badgers are also undefeated and face Michigan this week. The Wolverines have lost some luster, but a big game could put Taylor into contention. – A huge game that could have Heisman implications will take place… next week. The Iron Bowl looms on the horizon with Alabama against Auburn for all the bragging rights in the state, a chance for a SEC title and more. We could also be looking at two darkhorse Heisman contenders in this game. Alabama’s Jalen Hurts continues to do nothing but win for the Tide. Auburn’s Kerryon Johnson is now the leading rusher in the SEC. If Johnson can help the Tigers knock off the Tide, he could jump right into the mix. – The race for the Heisman is Mayfield’s to lose, but keep an eye on the contenders. Love and Tate deserve their chance in the spotlight with their video game numbers. Can they put up enough eye-popping stats and highlights to garner more votes? Or will somebody come up from the back of the pack for a late run at the trophy?